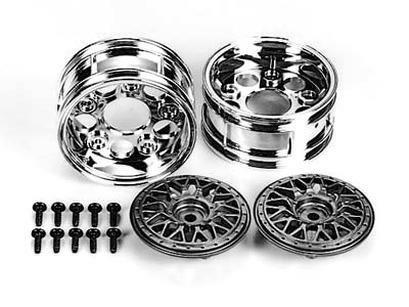 This is a two-piece mesh wheel set. The wheel rim itself is chrome plated while the mesh centerpiece is molded in gold. Assembly required. 2 types of offset can be achieved, depending upon the assembly method used. Compatible with 1/10 scale R/C touring car models using narrow 26mm tires.